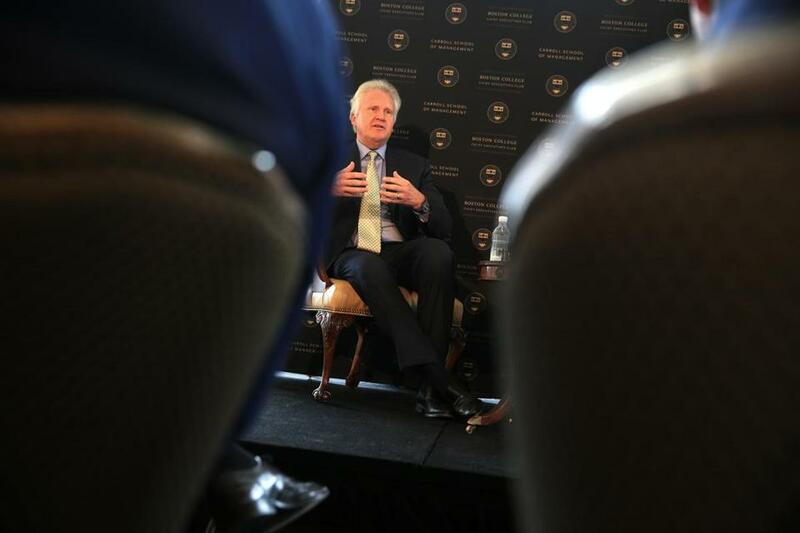 Jeffrey R. Immelt, the CEO of General Electric was at the guest speaker, at the Boston College CEO’s Club luncheon. General Electric chief executive Jeff Immelt took to the stage on Thursday to tell Boston’s business leaders just how important their city is in his grand plan to redefine the industrial conglomerate. This was his first public appearance in Boston since deciding in January to move GE’s headquarters here from suburban Connecticut, and Immelt tried to take full advantage of it. He said he sees this city as playing a pivotal role in the next wave of technology innovation, one that uses data and analytics to connect machines for big businesses. Under Immelt’s leadership, GE jettisoned its stake in NBC and most of its financial business. GE’s appliances will be sold next. Immelt wants to focus on GE’s industrial products — everything from jet engines to wind turbines — and the software that can make these machines more sophisticated. It was no accident that Immelt’s presentation was structured as a question-and-answer session with John Harthorne, the founder of local startup accelerator MassChallenge. Sharing the stage with a man who is synonymous with Boston’s startup scene makes sense for Immelt as he tries to build up GE’s software business and attempts to attract some of the country’s brightest software developers. With roots that date back to the late 1800s, GE would never be mistaken as a startup. But Immelt still wants his employees to think and act like they work at one. The move fromFairfield, Conn., to the Seaport area plays a key role, placing his leadership team in a vibrant city with a world-renowned innovation scene, instead of in a wooded Connecticut suburb. To attract GE to Boston, city officials pledged as much as $25 million in property tax relief. Governor Charlie Baker’s administration promised as much as $120 million in infrastructure grants and $5 million for an innovation center. GE, meanwhile, expects to spend in the $80 million-to-$100 million range for the new headquarters, including land acquisition costs. Immelt made an indirect reference to the public incentive package, which has drawn criticism because of its size. He drew applause from the crowd by promising to make this deal worth the investment. “For every dollar that was invested in GE being here, ... you will get back one thousand fold, take my word for it,” Immelt said. State Auditor Suzanne Bump, who lives in the Berkshires, asked Immelt about what the company will do for the rest of the state. She mentioned GE’s ongoing issues with pollution in the Housatonic River, although she noted that she’s more sympathetic to GE than some of her neighbors. Immelt responded by saying the company already employs about 5,000 people in Massachusetts. More could be coming, he said, on top of the 800 who will work at the Boston headquarters when it opens in 2018. Massachusetts Port Authority chief executive Thomas Glynn said he was impressed with what Immelt had to say.